Thank you for joining us at the 2017 Fighting Right to Work Summit! Information on the summit including agenda, workshop descriptions, and logistics information can be found below. We will also be adding resources from the playbook that will be handed out at the Summit. Messaging and Research – Unions have done research – polling, focus groups and other member discussions – to know what their members want and need. Come learn about this research, effective narratives to help promote the union with members and the public in the face of Right to Work and other attacks, and what messages unions have used to productively sign up members and leaders. Worksite Steward/Leader recruitment and training – Effective stewards and worksite leaders are the key to strong unions. Good organizers find multiple paths to move members to leaders. Come learn about the best examples of building member leadership in our unions. Worksite program and organizing – Stewards, Member Leaders, Worksite coordinators, Unit Reps. Every union has a different name and organization for their worksites. But one on one conversations must be the common theme. Come hear about great worksite programs and how they happen. Technology – We can’t let technology get away from us, we’ve got to use it as a tool to enhance our organizing and make it more efficient. Come hear how to maximize collecting and analyzing data about your members to most effectively communicate with them. Promoting the value of the union with our members – We’ve got to keep demonstrating the value of the union to members. Whether it is providing member benefits, discounts, contract protections or other benefits, we’ve got to identify, more than ever, we must show members the real value of the union in improving their lives. Unions will detail what they are promoting and ways they are communicating it. Going on the offense – We can’t just play defense, we’ve got to go on the offense to grow our movement. Hear about legislation, organizing, bargaining for the common good, and coalition work that is helping to build the labor movement. Growing our unions – The attacks we face intensify as our density declines. Unions are taking on new campaigns, reinvigorating strategies, creating industry organizing plans, and building multi-union campaigns. We’ll share campaigns from the western states that we can all learn from. Bargaining against Right to Work – There are things we can be bargaining for now to help inoculate against Right to Work. Come learn some ideas and help develop new ones! All day session: THURSDAY, JUNE 29, 10 am–5 pm; coffee mingle begins 8:30 am. Location: Grand Ballroom. FREE Shuttle from LAX: The Sheraton shuttle runs continuously, stopping by the airport and the hotel every 10-15 minutes, 24 hours a day. Serviced in conjunction with Joe’s Airport Parking, look for a yellow and red shuttle with blue Sheraton Gateway logo along the side. Find the shuttle pick up on the lower level of airport (near red courtesy red sign). 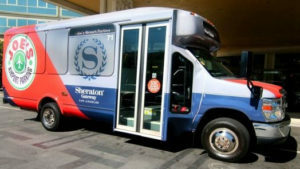 More details on the shuttle via the Sheraton’s website can be found here (site includes a photo of the shuttle). Parking Map available to view here. Summit Registration: Registration opens on Wednesday at 4:30pm – 7:30pm. Registration opens again on Thursday at 7:00am. Wednesday Reception: 5:30pm-7:30pm in the California Ballroom with light refreshments. Meals: Coffee and a light breakfast will be available Thursday morning. Join us as early as 8:30am and meet people from throughout the west! A plated lunch will also be served on Thursday.